This afternoon several hundred thousand Jews gathered at the entrance to Jerusalem, in response to the recent conclusion of an Israel government committee that Orthodox Jews who resist the draft should be subject to criminal prosecution. The Orthodox responded with the weapon the Jewish people knows best: prayer. Many of those gathered held signs proclaiming that Jews would give their lives rather than serve in the IDF, and that the Israeli government has lifted up its hand against the Torah. The prayer gathering was called by the rabbinic leaders of the Agudath Israel movement. Historically, the Agudah has been opposed to Zionism in principle but willing to work with and participate in the Israeli government in an effort to ensure that Orthodox Jews could continue studying and practicing the Torah even under the Israeli regime. In the present case, it seems that Agudah recognizes that all internal efforts have failed and the law to forcibly draft Orthodox Jews, known as "Chareidim," will be passed. Military-age men who refuse to serve, as the rabbis have instructed them to do, will be faced with the choice of going to jail or leaving the country. It seems that the time has come of which the Satmar Rebbe spoke in 1967 and said, "In a few years no Jew will be able to live in Eretz Yisroel! They will eventually chase every Jew out!" Against this background, today's gathering was as much for self-strengthening as it was for prayer. 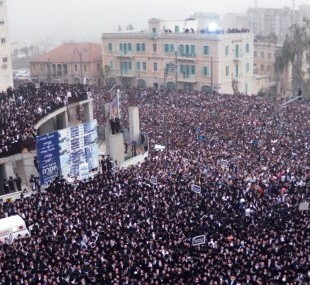 The crowd shouted the "Shema Yisroel" and "Hashem is G-d!" with full faith and courage, resolving that come what may, they will not succumb to the State of Israel's efforts to force them to join its army. In that spirit, the gathering ended with singing and dancing. Meanwhile, the Times of Israel pointed out some important facts about the new law, overlooked by many. Criminal sanctions will go into effect only in mid-2017, after the next election. In the meantime, life will improve for the Orthodox: those who have families to support and are in desperate need of jobs, but have been staying in yeshiva only to obtain draft exemptions, will be allowed to go to work without fear of penalties. This may be a ploy by Yair Lapid, chief architect of the new law, to expose the claim that the Orthodox refuse the army only because they don't want to abandon their studies. But on the contrary, Orthodox Jews opposed to Zionism would be happy to see that claim discredited. We are proud to let the world know the real reason we refuse army service: because it is forbidden for Jews to have their own country or fight wars before the coming of the messiah.